When you want to cook Thai food outside of Thailand and rare ingredients are missing or their availability is limited, we learn how to make substitutions for critical ingredients. Thus it often transpires that some ingredients in traditional dishes change over time. Green papaya salad – Som Tum – is not acceptable without green papaya, so how do you create this traditional dish when the freshest texture and flavor are important and all you can find is an aging and bitter green papaya? My friend in Switzerland and some Hmong farmers in the Pacific Northwest use sweet, fresh local carrots from their gardens in place of the hard-to-find green papaya. The homesickness for this traditional dish can be cured by the sound of the mortar and pestle and the pungent authenticity of the rest of the ingredients. I never forgot the taste of the Som Tum I ate in Switzerland after being away from Thailand for two months for the first time. Love the one you’re with! The best and freshest ingredients from our garden can also replace the absent or impossible to find tamarind leaves. This is perhaps what led me to this next local Pacific Northwest ingredient—sorrel—and the discovery of a pattern of substitutions: the similarity of the texture of carrots to that of green papayas, the similarity of the flavor of sorrel leaves to young tamarind leaves, and the similarity of the flavor and texture of green apples to green mangoes. I am not here to change Thai cuisine. These new dishes arenot the same as the old, but the substitution of nostalgia for a traditional culinary love affair. 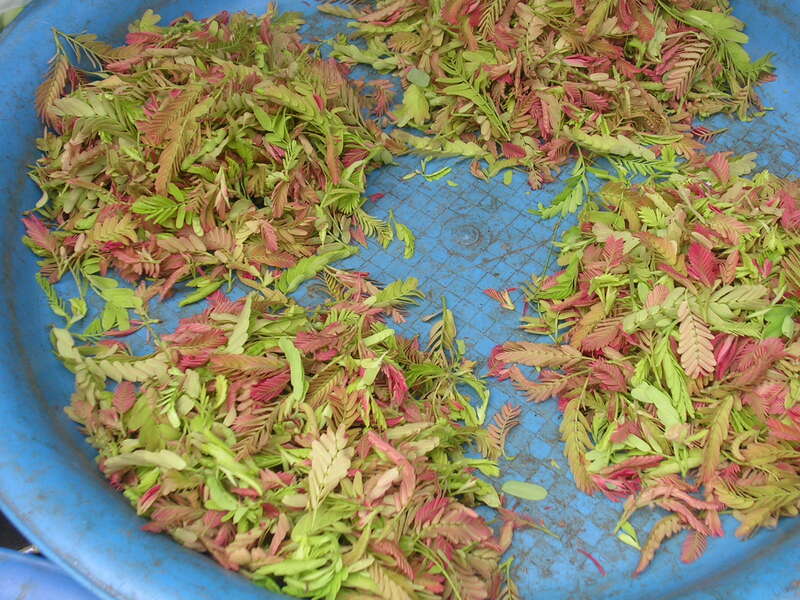 Young tamarind leaves have been used as food in Southeast Asia for a long time. My family and other Thais in my village cook them in vegetable stews like Tom Som and use them to add a sour flavor to coconut milk and non-coconut milk based curry dishes. In addition to having a delightful tangy sour taste, tamarind leaves have a medicinal benefit: they are packed full of vitamin A.
Sorrel– ซอรเรล- Rumex acetosa is native to Europe and northern Asia. Only 15 years ago, I discovered cooking with sorrel for the first time. It was at a Thai community kitchen when some elders from Lao and Cambodia brought a fresh sorrel and vegetable condiment. 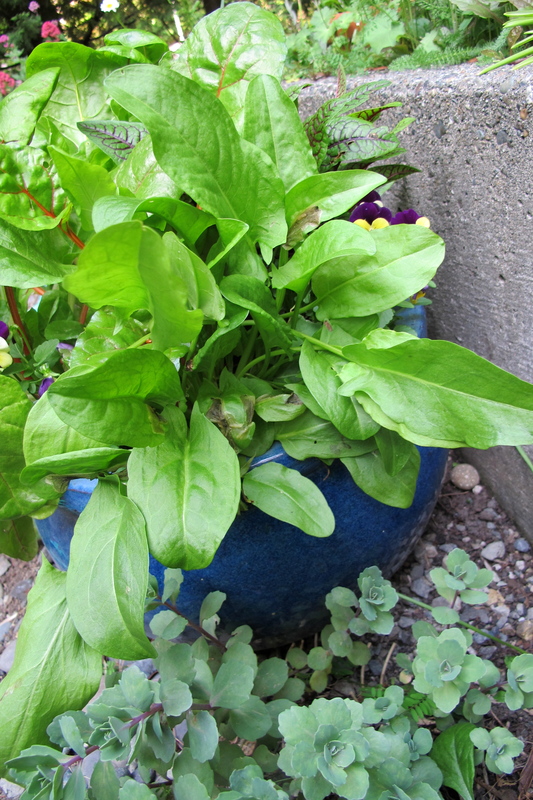 Then my friend Ruth Huffman showed me the sorrel in her garden. Ruth uses it as a leaf vegetable and culinary herb. Now I have three vegetables in my garden from the Polygonaceae (buck wheat) family: regular sorrel, sorrel ‘raspberry dressing’, and rhubarb. Sorrel is recommended for eating in small quantities because of its oxalic acid content. High levels of oxalic acid, like in the green in rhubarb leaves, can be a poison. In the recipe below, you can use more Swiss chard if you do not have sorrel and simply add more lime juice as desired. I am staying in town this summer and you will find me posting more Thai recipes made with wholesome local sustainable foods. My summer lifestyle is big on gardening, grilling, and entertaining outdoors. From left to right, I combine regular sorrel, sorrel ‘raspberry dressing,’ and baby Swiss chard from my garden in this curry. 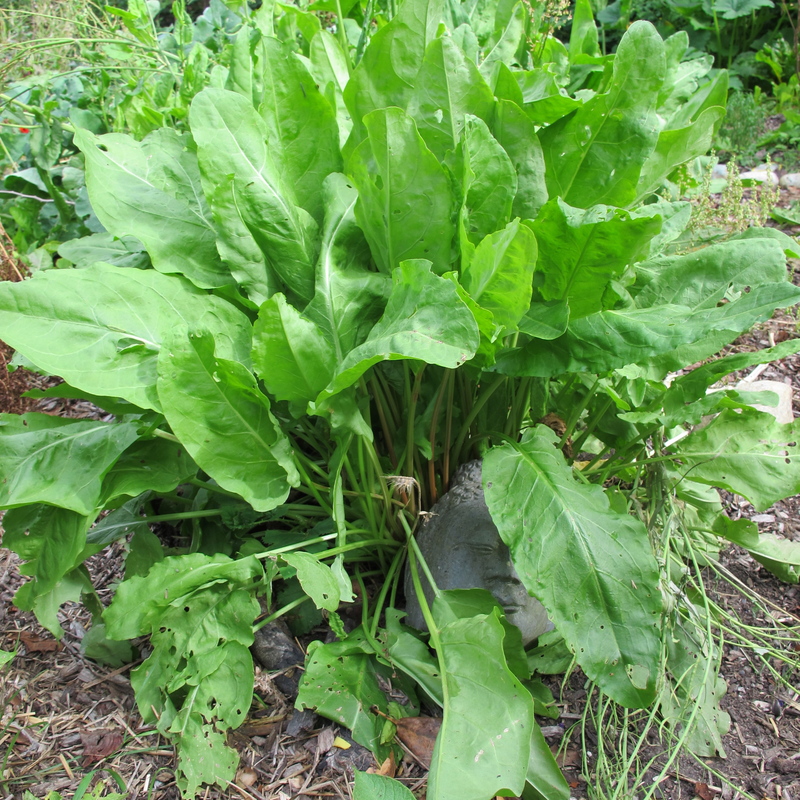 You can find sorrel and Swiss chard all year long in the Pacific Northwest. 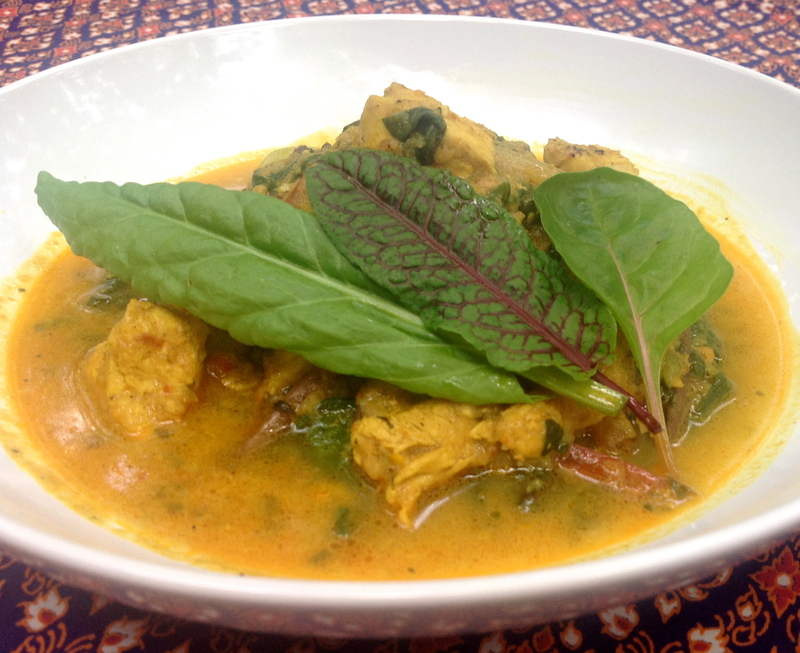 The delightful taste of Khmer chicken curry with sorrel leaves can make it hard to make the recipe stretch to six servings. This curry is more of a comfort food, reminiscent of vegetable stew, with a hint of citrus curry—rice porridge with a wonderful aroma. It is packed with health benefits from fresh turmeric, galangal, and tamarind or sorrel leaves. The curry is flavorful, but not hot, and the coconut milk is only required to taste. The toasted rice makes the soup rich in texture but light in taste. I enjoy this as a one-dish curry meal with a bit of steamed rice on the side. This recipe tastes best made with fresh Khmer Curry Paste or Phuket Curry Paste. Heat a pot with a heavy bottom on medium-high heat, then stir in canola oil, chicken, and Khmer curry paste; cook until fragrant and you see the oil separate out from the remainder of the ingredients. Pour in 1 cup water and let cook on medium heat with the lid on until the chicken is tender, about 10 minutes. Stir in coconut milk and toasted rice powder and cook for 5 more minutes. Stir in sorrel, Swiss chard leaves, and lime juice and cook for 30 seconds. Serve right away with warm steamed jasmine rice. I attended the Hungry Planet: What the World Eats grand opening at the Burke Museum. I was totally awestruck by the large photographic exhibit and printed information from Peter Menzel and Faith D’Aluisio who show us how the rest of the world eats and feeds their families with one week of purchased food supplies. “A picture said a thousand words” and I hope that you will have a chance to view the exhibition which will be at the museum through June 10. On Saturdays, PCC Cooks also participates in the exhibition by providing a cooking demonstration of one of eight different cuisines from around the world. I had the honor of representing PCC Cooks one Saturday by preparing Kao Tom Gai, Rice Soup with Chicken. I demonstrated how to prepare this Thai dish and provided samples. When I was growing up in Thailand this particular dish meant so much to me and the rest of the country. It was a time when families had to nourish their families with simple, healthy foods. I was lucky to grow up in the land of plenty in Phuket, Thailand. My village has a mountain on one side and a rice field on the other. The Srisunthorn Road was on the edge of the mountain and our home was just off this main road. We spent our weekends gathering foods from the forest such as bamboo shoots, mushrooms and other edible plants. Our family also owned a plantation which provided an abundance of fruits such as rambotant, durian, jackfruit and coconut. At the end of each month, or after each sale of a crop from the plantation, my grandmother made sure to purchase a month’s supply of rice and to stock up on all stable dry ingredients. 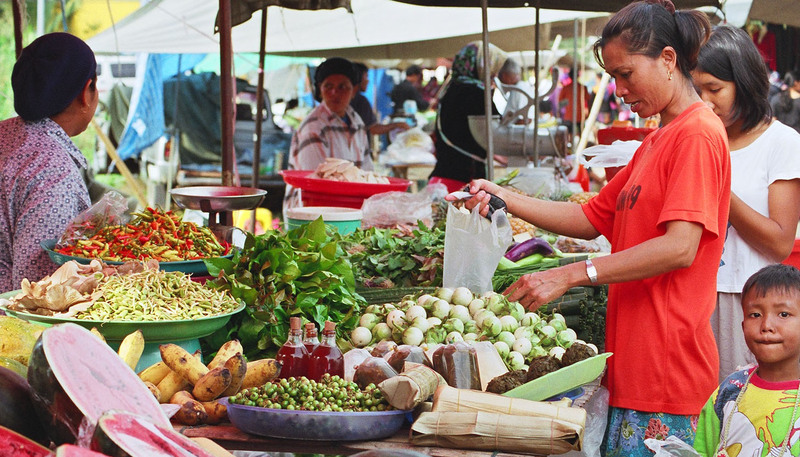 Mobile markets would came every morning with meats, seafood and fresh vegetables and herbs. The open air market was full of venders of all sorts and once a week villagers could fill up their kitchen cabinets with food. In our family, when my grandmother was the treasurer of the household, she decided what was on the table on a daily basis, through times of abundance and scarcity. My grandma shared many bedtime stories with us about the lives of others or her experiences during economic down times. She taught us that every grain of rice should be eaten. Phuket is rich in tin, rubber and other natural resources, but when it came to rice production, we depended on supplies from the central part of Thailand–a supply that was affected by the economy, politics, and climate. When the price of rice increased, our regular steamed rice would change to rice porridge to make our supply last as long as possible. One cup of rice grains yields about 3 cups of steamed rice or 4 cups of thick rice porridge which can be thinned down to make 6 cups of rice soup. Instead of making 3 servings, 1 cup of rice can be stretched to provide 6 servings. The Hungry Planet exhibit is eye opening. It shows how the rest of the world eats, what is available to them, what they can afford, what they choose, and the limitations. I love the picture from Mali, Africa, which shows the ritual of a family sharing a rice porridge that is cooked with sour milk. For me, rice porridge is a soul food, comfort food and a health food. It has a healing and nourishing element and it is suitable for everyone and every occasion. Now that you have heard my stories, what is yours? A second way to enjoy rice porridge is to make a rice soup buffet for a big crowd or special event. To do this, take a rice porridge and add a little bit of ground meat. Cook it without adding flavoring, but serve it with condiments as shown in the photo below. 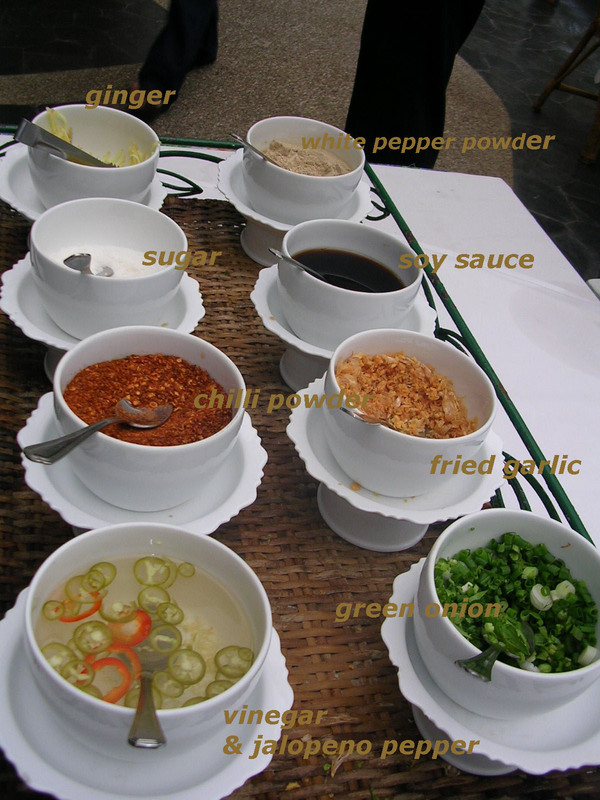 The condiments typically consist of ginger, white pepper powder, sugar, soy sauce, chili powder, fried garlic, vinegar with jalapeno peppers and green onions. A third way to eat rice porridge is to serve it the same way as steamed jasmine rice but ideally with Chinese-Thai style main dishes such as stir-fried vegetables with salted soy bean or oyster sauce, salted egg, salted peanut, pickled mustard green, or braised pork in five spices. Either for stretching a dollar or caring for yourself and your family, rice porridge is my comfort food for every occasion. Bring jasmine rice and 2 cups of the water to a boil on high heat. Stir often while cooking for 5 minutes. Add the remaining 4 cups of water and bring to a boil. Let cook on medium heat for 15 minutes more, until it yields 4 cups. Are Winter Squash Leaves Edible? I enjoyed the Seattle sun last Wednesday at the Columbia City Farmers Market along with the delicious food from the stalls. I purchased a few fresh vegetables from various farmers and, like always, a bunch of winter squash leaves from a Hmong farmer’s stall. This time the squash leaves prompted me to cook and share with you a recipe from my Thai kitchen: how to cook winter squash leaves –Yod Namtao – ยอดน้ำเต้า. Winter squash leaves are edible. In fact, all parts of squash family plants are edible, from leaves to stems, flowers, fruit, skin and seeds. The young leaves and stems are shown in the photos above and below. These edible greens become available when a farmer cuts back the leaves on a plant in order to encourage it to produce fewer but larger fruits. Winter squash leaves are popular in rustic-style cooking in Southeast Asia and they are great sources of fiber and other nutritional benefits. Though they may feel a little rough to the touch, the young leaves from winter squash have amazing flavors when cooked. They have a spinach-like texture, but are richer and denser with a bite to it in flavor. Like any leafy green vegetable, you can stir-fry, steam or stew them. In my kitchen, I either blanch them in salted coconut milk or saute them with butter, then add water and chicken stock and cook them down until the leaves are softened but not mushy, about 5 minutes. Last year I made a winter melon leaves stew with dried fish and shallots using a Hmong farmer’s verbal recipe. It was similar to my Watermelon Rind Soup and made a delicious vegetable stew. 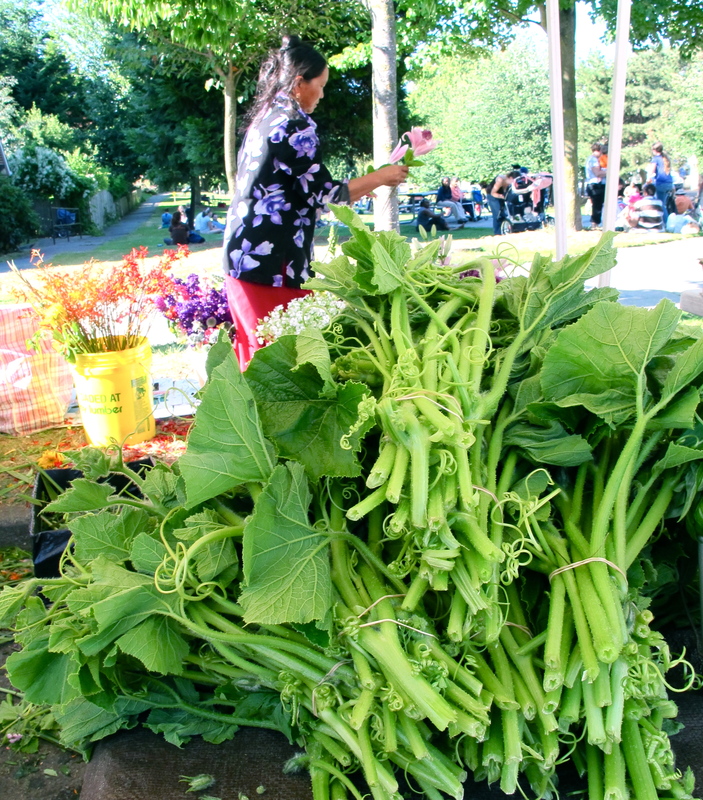 Winter squash leaves are only available in the summer and only at the Hmong farmers’ stalls. Because of this limitation, I never fail to purchase a bunch of winter squash leaves each visit to the market. Supporting the Hmong farmers also helps me to ensure that there will be a continuing supply due to the demand. When you get a chance, please pick up some winter squash leaves at a Seattle Farmer Markets near you and give them a try. One bunch of winter squash leaves weighs about a pound. After removing all of the twine holding them together and the hard stems, the soft edible part weighs about six ounces; the rest goes into a compost. If I have time, I use a peeler to remove the rough skin on the stems then cook the stems down until they are soft, about 8 minutes. There are many ways to prepare winter squash leaves, but blanching or boiling them in salted coconut milk produces my favorite quick and easy side dish. 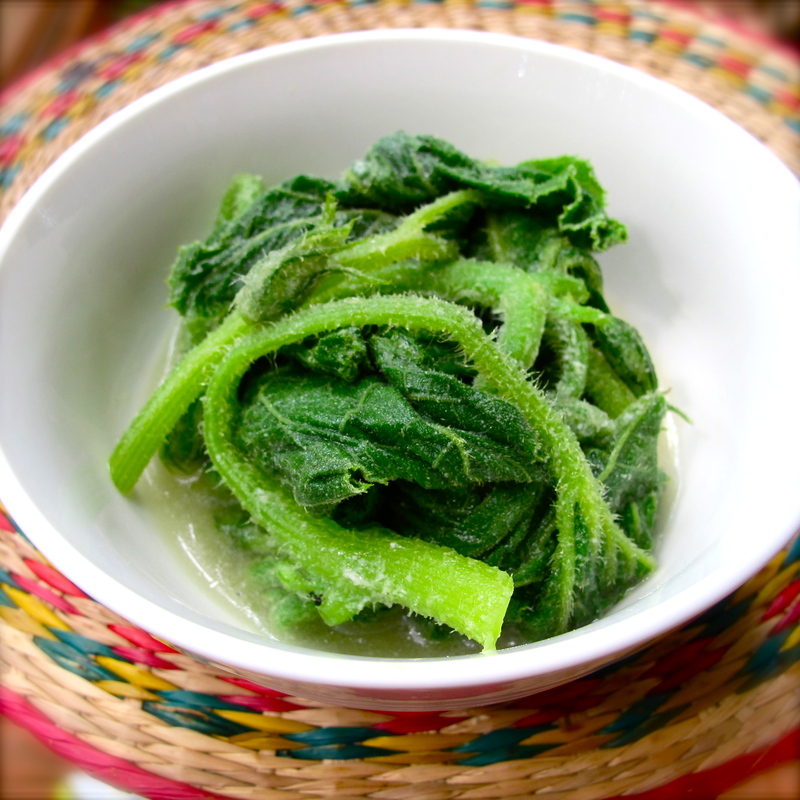 This same method can also be used with many other leafy green vegetables, which can then be served with Thai Chili Dip. You will be surprised how the flavor of winter squash leaves and leafy green vegetables are complimented by just a little coconut milk and salt. Bring coconut milk, water and salt to a boil on medium-high heat. Then add the squash leaves, using tongs to turn them around to make sure they are all cooked in the liquid—like blanching the leaves in a coconut broth. Cook from 3 to 5 minutes until the greens reach your desired degree of tenderness. Serve with the broth as a side dish, or with warm jasmine rice as a main dish. Pranee teaches Thai Cooking classes in the Seattle area. Her website is: I Love Thai cooking.com . I often hear the old Thai saying หวานเป็นลม ขมเป็นยา: kwan pen lom kom pen yah. This culinary wisdom literally says “the sweet is a faintness and the bitter is a medicine.” Growing up in a village in Thailand with my grandma and her friends, I acquired a taste for the bitter and exotic vegetables from their gardens and the wilderness around us. Bitter melon or Bitter Gourd is called มะระ—Mara—in Thai. Its scientific name is Momordica charantia and it is native to Asia and Africa. It is a climbing annual plant that one can grow anytime, anywhere in Southeast Asia and South Asia regardless of the season. In most Thai or Asian villages, where there is a fence or an arbor there will be a climbing plant next to it. There just needs to be a space large enough for seeds to grow. Bitter melon is best eaten when it is green and young. When the fruit grows older, the taste gets more bitter. It is not common to eat the older fruit when it turns yellow-orange and the seeds become red; at this later stage the plant is mainly used for growing the seeds for future new plants. 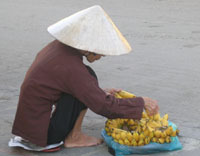 Bitter melon is widely cooked in many ways in Southeast Asia. In Thailand, I often enjoy it in stir-fried dishes with soy sauce and with or without egg. It is also popular with mara yad sai—stuffed with pork in a soup. Fresh green or boiled bitter melon can be served in a Thai crudites platter with Thai chili dip, or it can accompany pickled cabbage in a pork-bone soup or stewed bitter melon and pork-bone soup. It can also be cooked in a curry dish as well. 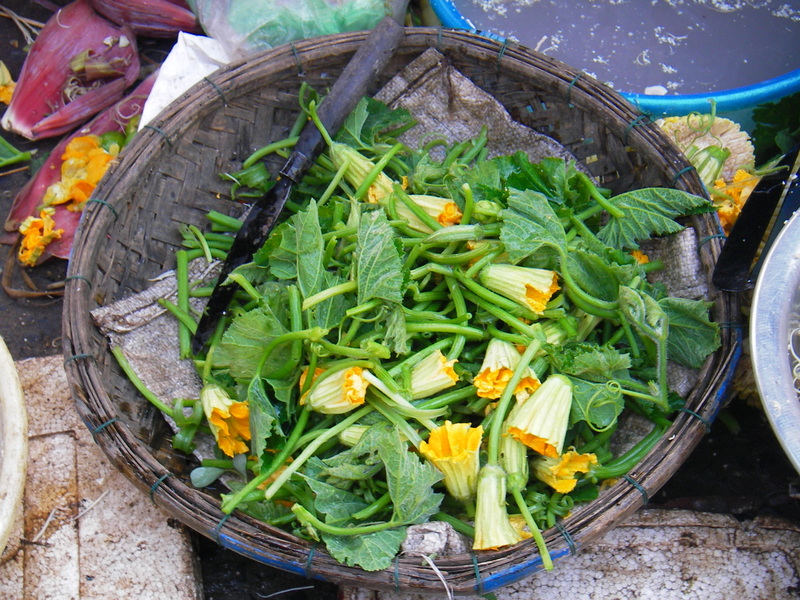 In Myanmar and Bangladeshi, bitter melon is often stir-fried with garlic and turmeric powder. All parts of the fruit are edible after you remove the seeds and stem. For stir-fries, thin-slice the melon as shown above. Then I often take steps to reduce some of the bitterness. There are two ways to do this: put the sliced melon in boiling water for a few minutes and then strain out the melon and discard the water. Or sprinkle some salt on the melon, mix it in well and let it sit for a few minutes before rinsing them in water. You may squeeze to dry. I personally like to use this latter method before making my stir-fries as some of the bitter flavor is left behind. Why should you eat bitter melon? For much the same reason that you eat broccoli or spinach: for their health benefits. Bitter melon is an aid to diabetes control. It lowers blood sugar and promotes healthy insulin levels; besides that it also has Vitamin C, B1 and B2. While more studies need to be done, it is time to learn about new vegetables like bitter melon or get back to eating them routinely and celebrating the sweet truth about bitter melon. Cheers to a bitter melon! When one has acquired a taste for bitter melon, stir-fried bitter melon with egg is a delightful dish. Personally, it makes me happy like after eating bitter-sweet chocolate. A bite of sliced bitter melon contrasts with the sweet, cooked egg and the hint of salty-soy flavor, making this three-flavor combination very memorable and it lingers on my palate. When trying this dish for the first time, don’t be afraid of the bitter that you will taste at first. Wait a little while and you will taste the sweet from the egg, then the salty from the soy sauce. Serve the stir-fried bitter melon as a side with a curry dish and warm steamed jasmine rice. Heat a wok on high heat until it is hot. Pour in 3 tablespoons canola oil and stir in garlic. When garlic is golden, stir in one egg and stir a few times. When the egg is cooked, stir in bitter melon. Stir for 1 minute, then add another egg and stir a few times before adding soy sauce and sugar. Add water or chicken broth and let it cook 1 minute. Depending on one’s liking, the melon should be not too soft or to firm; it should still have some crunch. Serve warm with steamed jasmine rice. I love having a stew cooking on my stove top while I am catching up with a pile of work. I have had a frozen pork belly in my freezer for a month now, waiting for the time when it will become Moo Palo, or Stewed Pork Belly with Cinnamon and Star Anise in Soy Sauce, a delightful dish of Thailand. I could no longer make excuses that I was too busy too cook—I can accomplish both working and cooking: Just let it stew. I worked at my home office all last week to meet my deadline for editing recipes and writing a proposal. When I saw the frozen pork belly in my freezer I pulled it out to thaw so that I could cook it the next day. The rest was simple. I cut the pork belly into pieces, placed them in a Dutch oven and sprinkled the remaining ingredients randomly on top. Then I let the stove top (or you can use the oven) do the work of cooking. I took a break from work from time to time to check on the stew. While it cooked itself on the stove top for 2 hours, in my office I enjoyed the aroma of soy and cinnamon and star anise interacting with each other. This dish is similar to Thai Moo Palo but I omitted the hard-boiled eggs and instead of using five spice powder, I used Vietnamese cinnamon and star anise. What I was looking for was a sweeter and more delicate flavor than from the Vietnamese version with cinnamon and dark soy sauce. It was surprising good and sophisticated. When I checked with my family they had no idea that there was a tablespoon of black pepper in it. It had just a hint of black pepper deepening the sauce. In Phuket, this dish is called by its Phuket Hokkien name: Moo Hong – หมูฮ้องสูตรภูเก็ต. I cooked it the same way my mother would, with the fat and skin attached to the pork belly to keep it sweet and moist. The important ingredients that give Moo Palo or Moo Hong Phuket its unique flavor are dark soy, crushed garlic cloves, black pepper, cinnamon powder, cinnamon sticks and star anise. Place cut up pork belly in a dish and stir in the dark soy sauce, light soy sauce, Vietnamese cinnamon powder and black pepper; mix well. Marinate overnight or for several hours. Place the pork belly and marinade in a Dutch oven over medium-high heat, then add garlic, star anise, cloves and brown sugar on top of pork. Brown the meat a little, then add water to cover the top of pork by 1 inch. Bring to a boil, then turn heat down to medium or medium low (depending on the burner) to create a nice gentle boil. Let it cook for 1 hour. Stir occasionally and add water if needed. After an hour and a half, cover the Dutch oven with a lid and let the pork simmer for about a half hour, or until tender. (It is tender when you can cut it with a fork and it breaks up nicely without an effort.) Reduce the sauce to 1 cup, about ¼ cup per serving. Vietnamese Cinnamon or Saigon Cinnamon has more essential oils and 25 percent more Cinnamaldehyde than other kinds of cinnamon. You may add 4 shelled hard boil eggs during the last 1 hour of stewing time. It is also delicious served with cooked thin rice noodles. An alternative cooking method is to braise the stew in the oven at 300°F for 3½ hours. Her website is: I Love Thai cooking.com . Yesterday, April 17, 2011, I celebrated Thai New Year’s Day~ Songkran~ with Thai and American friends at the Songkran Festival at the Washington Buddhavanaram (Buddhist temple in Auburn, Washington ) It was so much fun, Sanuk. First, we started with the alms-giving ritual. We gave offerings to the monks of steamed jasmine rice and steamed sticky rice, and for the first time I offered Chicken Biryani Rice (Kao Mok Gai) instead of the two other kinds of cooked rice. Outside in the yard there were tents with prepared street foods of Thailand, just like at festivals in Thai villages. I sampled almost everything including grilled Thai sausage (Sai Grok Isan), sticky rice (Khoa Neow), green papaya salad (Som Tum), and noodle soup (Kuey Tiow Nahm), to name a few. A majority of the guests at the festival were from Laos, northeastern Thailand and Cambodia. Steamed Sticky Rice (Khao Neow) is an important part of the day at many Thai gatherings, and Khao Neow and Som Tum are well-loved dishes for Thais who live abroad. As I have mentioned before, these two dishes are a good cure for homesickness for Thais. We walked around, enjoying the sunny day and buying street food like Thai Chili Dip (Nam Prik) to take home. I got three different versions of this red-hot chili paste to season my steamed jasmine rice: Red Eye Chili Dip (Nam Prik Ta Daeng), Tilapia Chili Dip (Nam Prik Pla Nill) and Crunchy Pork Chili Dip (Nam Prik Moo Grob). Now these three Nam Prik are in my freezer for days when spicy hot food will comfort my mood. In Burma, Laos, Thailand, Southern China and Cambodia, a part of celebrating Solar New Year is bathing and cleaning an image of Buddha. I celebrated this ritual here in Washington with many people from these countries. Building a sand hillock and decorating it with flags is also a common practice. Eating a lot of sticky rice and dancing to Laotian live music was a perfect “sanuk” day to welcome the new year. Sticky rice is a long-grain rice with a sticky and soft texture. There are several names for sticky rice, including sweet rice and glutinous rice. Sticky rice is ideal for desserts as well as for serving with Northeastern dishes such Som Tum (green papaya salad) and Laab Neua (beef mint salad). There are also main dishes on my blog that are great to serve with steamed sticky rice, such as Green Papaya Salad with Smoked Salmon, Grilled Fish Sauce Chicken Wings (Peek Gai Nam Pla Yang), and Green Papaya Salad with Salted Crab and Rice Noodle (Som Tum Sua). This last recipe includes a video of my sister-in-law preparing the salad. I hope you have a chance to learn how to cook steamed sticky rice. You may use a double boiler/steamer or purchase a bamboo steamer. Cover sticky rice with room temperature water at least 3 inches above the rice. Let rice sit for 2 hours or overnight, then drain off any excess water. Steam sticky rice in a steamer with a lid over high heat for about 30 minutes, or until the rice is soft. Flip the rice over so that the sticky rice on the top will go on the bottom and steam with the lid on for 5 more minutes. You can keep the rice warm for a few more minutes with the steamer on simmer, or remove it and keep it in a thermal-controlled container. The steamed sticky rice is ready to serve with main dishes or to use in a dessert that requires steamed sticky rice. Sanuk Mai? This is a question Thais ask each other when they share experiences of any activities you do in life. สนุก-Sanuk means to have a good time, to enjoy or to get pleasure and joy from anything we do. Tiew hai sanuk means travel and have a good time. Tum Ngan hai snuk, is to work and to enjoy working. When making choices in our life,“Sanuk” is a factor in our decision making: some pleasure has to be combined with whatever we do. And when life is lacking Sanuk, then let’s plan it. This week in Seattle, I am going to do something I actually planned a month ahead to “Sanuk” with friends and that is to celebrate Thai New Year’s Day, or Songkran, with friends at the Washington Buddhavanaram. Songkran is Thai New Year’s Day. It is is a national holiday in Thailand celebrated on April 13th. It is also a New Year’s Day for Lao, Burma and Cambodia. The Thai New Year is a solar new year, and not to be confused with the Chinese New Year, which is a lunar new year. In Seattle, the Thai community celebrates the holiday on Sundays so that locals can take time off on the weekend to celebrate. Please click here to see how these countries celebrate: Cambodia, Laos, Mon-Burmese and Thai. 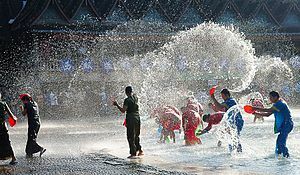 Many westerners know this celebration in Southeast Asia as the Water Festival. Songkran is such a special day that we can’t complete our Sanuk without sharing food. Everyone brings food to share, which is set out on the table, then a bell is rung to signal lunch time. Sticky rice is well-loved, and the most popular dish to share. I decided to do Kao Mok Gai (Phuket Baryani Rice) as a main dish, and sticky rice in bamboo tubes (my version with parchment paper in the oven) for a dessert. I chose these recipes because I wanted to do something that was easy to cook in large quantities and also something that is a traditional dish and a crown pleasure. 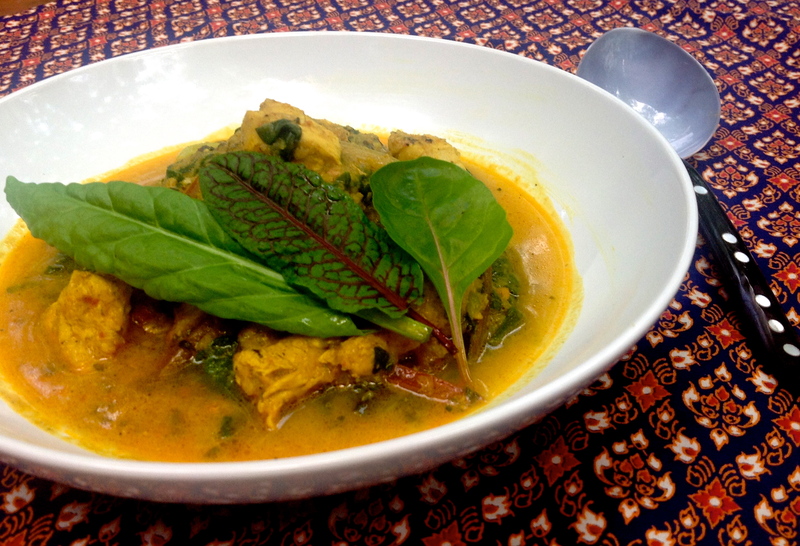 Kao Mok Gai is a special dish from Phuket for a special event. In Cambodia,sticky rice in a bamboo tube, known as Kralan, is a traditional dish to be eaten on New Year’s Day. Here are links to recipes for these dishes that are already available on this blog: Kao Mok Gai and Kao Lam. 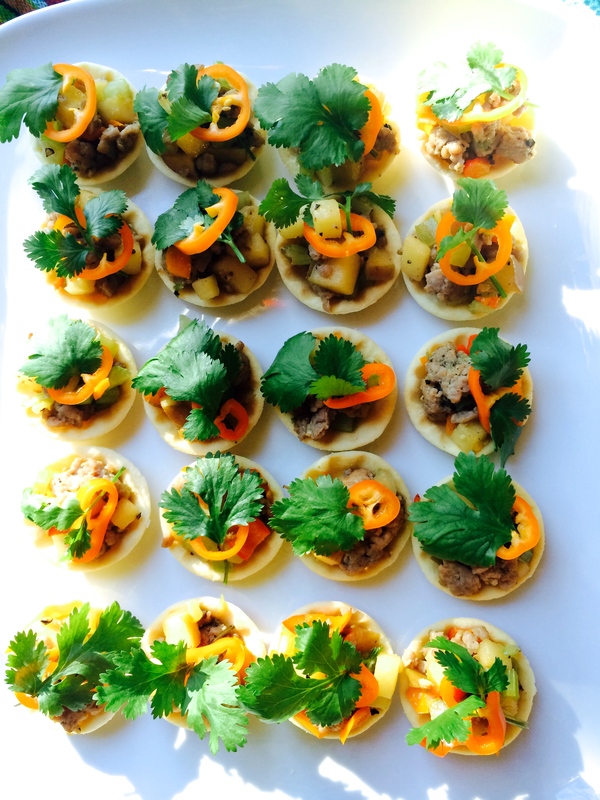 I hope to get some more recipe ideas at this event as well as some photos to share with you. May I wish you a Happy Thai New Year and have a lot of Sanuk in the coming year.